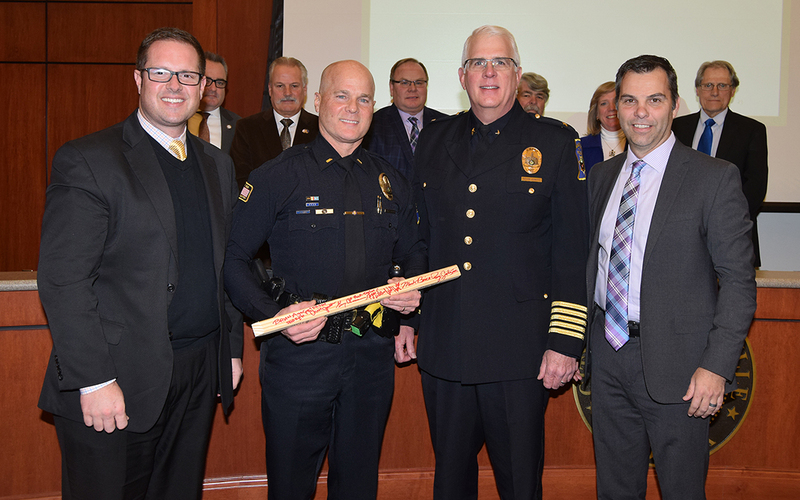 At its Jan. 29 meeting, members of the Noblesville Common Council presented its annual Stake in the Ground Award, which recognizes city employees who go above and beyond their jobs. Each member of the council makes a nomination, and then all members vote on the award. Noblesville Police Dept. Lt. Bruce Barnes is the recipient of the 2018 award. He is the public information officer for NPD who addressed media during and throughout the investigation of the May 25, 2018 Noblesville West Middle School shooting. Councilor Mark Boice said Barnes does an exceptional job of portraying Noblesville well on a national level through many trying situations. During his career, Barnes has served NPD in a variety of capacities, including shift supervisor, shift commander, SWAT team commander and honor guard commander. He also has been in charge of recruiting for more than 10 years and created the NPD crime watch program. He also created and still operates the NPD Citizens Academy. He began working for Noblesville in November 1993.